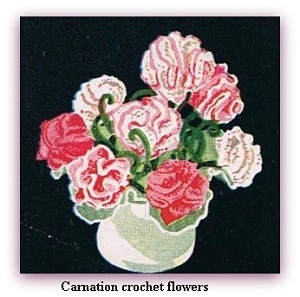 Free crochet flower patterns carnations in a variety of colors make a pretty bouquet. Heavy flower Wire for Stems. Medium Wire for Leaves. Calyx: With Green ch 5, join to form a ring, ch 1 and work 10 s c in ring, join. 2nd Row-Ch 1 and work 2 s c in each s c, join (20 s c). 3rd Row-1 s c in each s c, join. Repeat the last row 5 times, cut thread. Next Row-Attach Color, * ch 9, skip 1 s c, s c in next s c, repeat from * all around (10 loops). Next Row-Sl st into loop, ch 7 and work 29 d tr tr c (5 times over hook) in same space, * 30 d tr tr c in next loop, repeat from * all around, join in 7th st of ch. 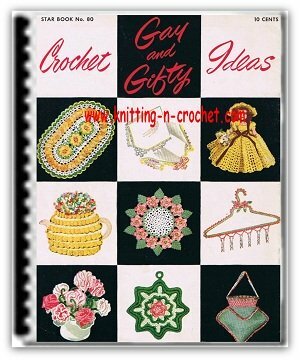 Next Row-* Ch 2, s c in next d tr tr c, repeat from * all around, cut thread. If desired this last row may be worked with a contrasting color. 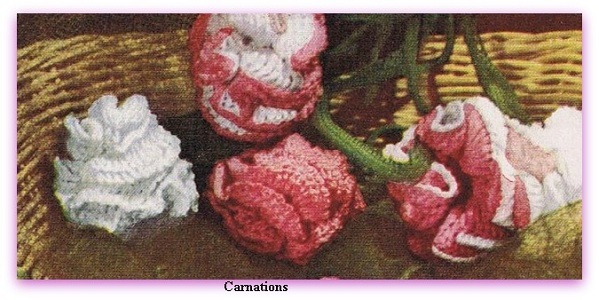 Fasten a knot in end of heavy wire and pull through calyx, fill calyx with cotton and sew together under the flower. LEAF: With Green ch 50, s c in 2nd st from hook, 1 s c in each remaining st of ch, working on other side of ch and over a 7 inch length of medium wire, leaving 2 1/2 inches of wire free at lower edge, work 1 s c in each st, join, cut Green. Work 2 more leaves in same manner for each flower. Cover flower stem with a 1/2 inch strip of Green crepe paper and attach 1st leaf about 1 1/2 inches from calyx and each of the next 2 leaves about 1 inch apart working down the stem. This is one of many free crochet flower patterns included in this great ebook.